The Pay Your Age event at Build-a-Bear was hugely popular, with hundreds of families queuing for hours to get a bargain bear. Luckily you don't need to queue like that again, as Build-a-Bear have launched a new pay your age scheme called Count Your Candles, with a special Birthday Treat Bear and a birthday ceremony in store! 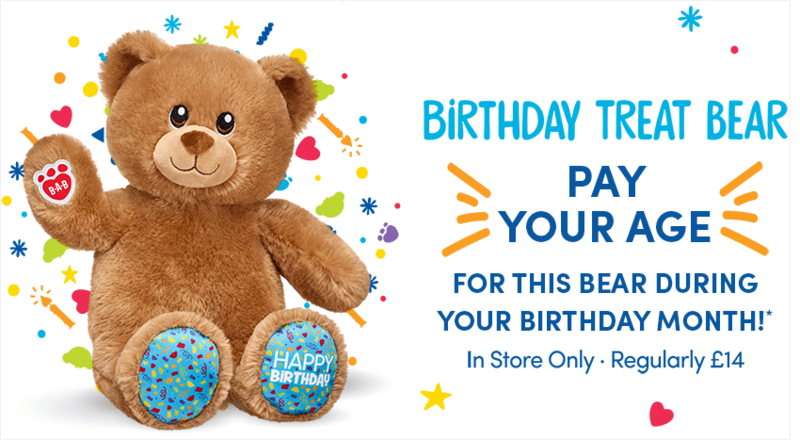 Each year in the month of your child's birthday they will be able to go into a store and get the special Birthday Bear and just pay £1 for each year of their age. So a four year old will pay just £4, a five year old £5 and so on. These bears normally cost £14, so it's a great offer to pay your age instead. This is an in store offer only, and you need to be a member of the free Build-a-Bear Bonus Club, and you can register online here*. As well as the cut-price bear your child can get more extra treats when they collect their Birthday Treat Bear. They will get to pop in an extra special birthday heart, and have a birthday ceremony with a birthday hat and sticker, ring the birthday bell, get to take a picture with the birthday cake prop, and even have Happy Birthday sung to them. You can find full details of the Count Your Candles promotion here*. We'll definitely be getting one for Phoebe, we're part of their member club thing. Might be a silly question but who's details do u put in when signing up mine or my sons? Yup! Was in today to see if they’d give him it early but nope! Yeah it's the whole month. Does anyone know if the child needs to be present or can you go without them? ?